A British couple, Alan and Anna Betts, were holidaying with Anna’s parents near the famous Loch Ness in the Scottish Highlands when Tatiana, Anna’s mother, snapped a landscape picture of the Loch area during a sudden rain shower. The family did not notice anything unusual about the photo at the time. But after the couple returned home to York, they noticed two disc-shaped objects in the photo while looking through their holiday photographs on their PC. The photo appeared to show a pair of disc-shaped objects flying over the famous Loch Ness, near the Urquhart Castle, according to the Daily Mail. It is not the first time UFOs appear over Loch Ness. 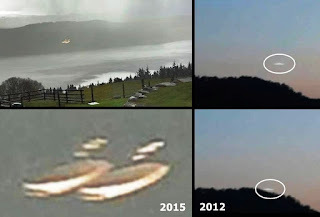 A UFO filmed in 2012, seems to disappear behind the mountains.